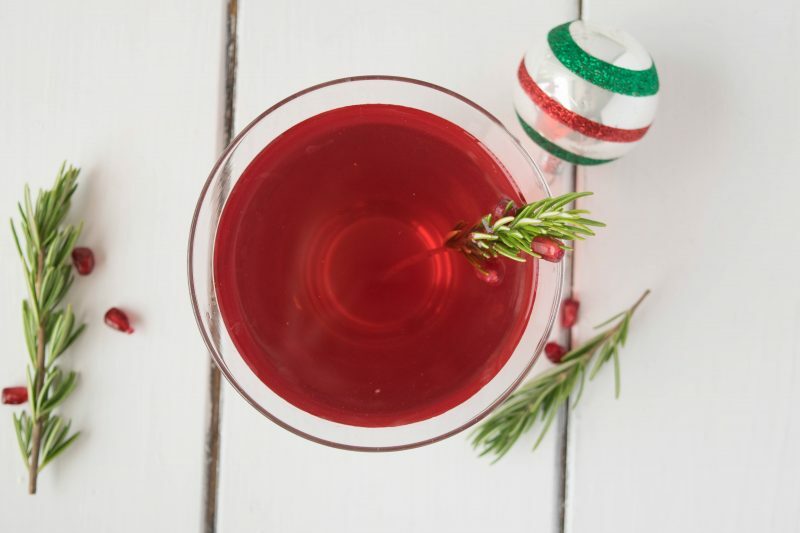 A festive twist on a popular classic drink. 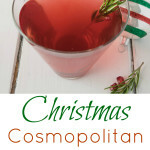 Christmas Cosmopolitan is made with pomegranate juice, ginger beer (or ginger ale) for sweetness and, of course, vodka. This could be called a pomegranate ginger martini, but Christmas Cosmopolitan is a much more fun name. Let’s talk about the vodka, I like Absolut Kurant with it’s black current flavor. It’s not sold everywhere, in fact, it’s hard to find but my local BevMo always has it. I like it on the rocks with a splash of cranberry and I think it works really well in this cosmo. If you can’t find it, any of your favorite vodka will work. To make a festive garnish, I took fresh sprigs of rosemary and poked a hole through with a toothpick then carefully threaded them onto the leaves of the rosemary. Fun! 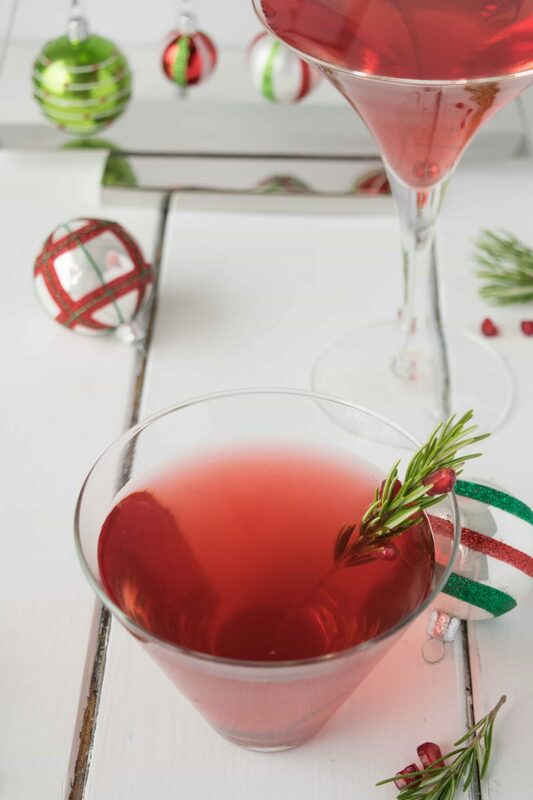 Just because this is a Christmas Cosmopolitan, it can be served all month long and is perfect for your New Years Eve party. 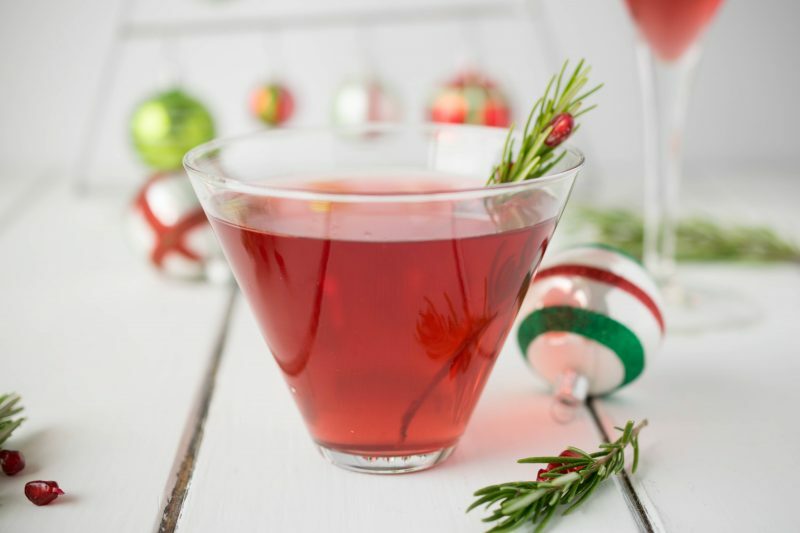 Christmas Cosmopolitan is made with pomegranate juice, ginger beer (or ginger ale) for sweetness and, of course, vodka. Fill a martini shaker with ice. Add all the ingredients and shake for 10 seconds. 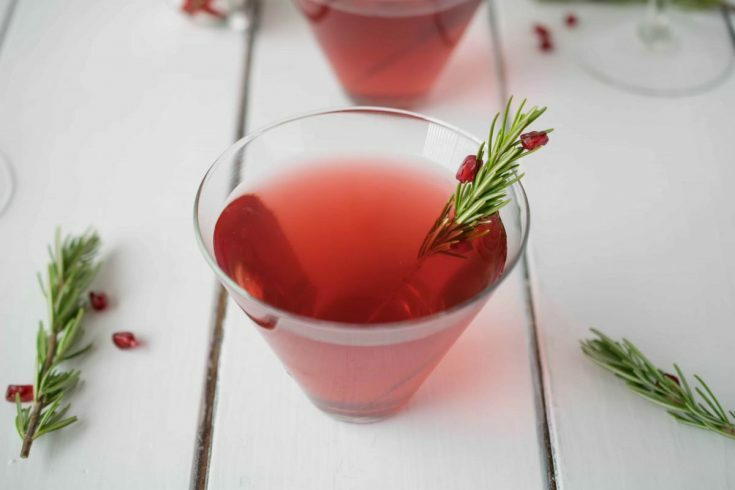 Pour into chilled martini glasses and garnish with rosemary sprigs. Looks beautiful! One of my favorite cocktails! Pinned! So pretty and so festive! I will cheers to this drink!